Families (or a lack of one) are an important feature in “Skip Beat!” and their portrayals often impact the heroes to a great extent. The situation of Kanae’s family is part of her motivation to succeed as an actress. Chiori Amamiya has a supportive mother, but for a long time, she acts as if she finds that suffocating. And, of course, I already spoke about Maria and how her family shaped her. 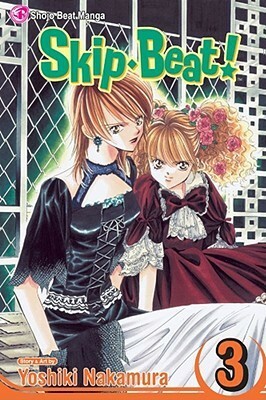 Throughout its length, “Skip Beat!” supports, and even sometimes confirms, Larkin’s words. Every character’s motivation, and those of the main ones especially, is born from their upbringing. Kyoko’s biological father never makes an appearance in the manga, at least to my knowledge. Her mother, as we already saw, was a cold, borderline abusive woman who installed the fear of losing someone’s love in Kyoko from early childhood. Then, when Kyoko was of a certain age, she abandoned her to the care of the Fuwa family. The Fuwas raised Kyoko in such a way that she would, eventually, marry Sho and help run the family business. In itself, that isn’t so bad - after all, the skills she gained are the ones that helped her survive in Tokyo - but it says a lot about Sho’s family that they would have his future planned out so far in advance. In Tokyo, after Sho dumps her, Kyoko lives with an elderly couple, who own the restaurant where she works. The couple in Daruma-ya are important, if marginal characters - the Saicho (boss) is the first person to help Kyoko bounce back after her first unsuccessful audition, and the manga makes it clear they are there for Kyoko, offering her their silent support. This is important for Kyoko, who has never had a constant parental figure in her life. Finally, there’s the actor Hizuri Kuu - a star in both Japan and America, who Kyoko helps look after when he comes on tour. Though off at a rough start, Kuu and Kyoko eventually earn each other’s respect. He’s the one who stops her from impulsively rejecting a job offer because the part was similar to another, and gives her important advice. But, more to the point, he fills the role of a father figure, something that she’s been missing sorely. By letting her act as his son for a day, he inadvertently gives Kyoko an important experience - that of a loving, caring parent. Even after the exercise ends, Kuu still insists that Kyoko call him “Father”, and treats her as he might his own child. Kyoko’s experience is absolutely valuable. In spite of her unaffectionate upbringing, she still meets wonderful people who fill the void in her life. She’s the type of person who will flourish under the right conditions, and those interactions allow her to become more susceptible to other emotions as well - something that she, at first, lacked. By contrast, we have both Sho Fuwa and Ren Tsuruga, two men who became like they are because of their parents. Sho was raised alongside Kyoko, but the manga gives the impression that he was alternatively spoiled and suffocated by his parents. He’s a regular boy - charming when he needs to be, but frozen in terror at the sight of a crying girl. His parents had his future planned out, (going as far as “training” his future bride), but he didn’t receive nearly the same pressure as Kyoko did (or maybe he did, and I don’t remember - everything’s possible). It is implied that he left for Tokyo to “pursue his own way” in part to get away from his parents. It’s also made clear that he hates his real name, Shotaro, presumably because it’s too old fashioned. What’s interesting to me, however, is that he took Kyoko with him to Tokyo - surely, he would have been able to survive on his own before his career took off. So why ask Kyoko to come? After all, she’s the girl his parents chose for him. She’s made no secret of her feelings for him, and he ought to know that she has some expectations. I’m not willing to paint him completely as a freeloading villain because he is capable of empathy and determination at the face of a challenge. More importantly, when Kyoko looks like she’s ready to let go of her grudge against him, he always, always yanks the scab off and riles her up again. So basically, he doesn’t want to marry her, but he wants to be the number one thing on her mind. Perhaps Sho feels the need to keep Kyoko close because, deep down, he’s scared of being completely torn from his roots. I will propose a theory that, just like Sho is a stand-in for anyone who has ever wronged Kyoko, Sho views Kyoko as an embodiment of everything his parents wanted for him, like a kind of deadweight. In a way, neither of them views the other as a person, but as a compilation of flaws, hence why they hate each other. You may not agree with me, but it’s still a possibility. The last one, Ren Tsuruga, is difficult to analyze without spoiling too much of the manga. However, it is known that he grew up in a loving family, with two extremely successful parents. He worshiped his father, to the point where he wanted to be just like him, but the pressure of the outside world crushed him, to the point where he had to make a new identity for himself. Still, he shares this trait with Kyoko that he wants to make his parents proud. So out of the three main characters we have someone who was abandoned by her birth parents, but flourishing under the care of surrogate ones, someone who ran away from the expectations heaped on him, and someone who was forced to create new identity despite having been raised in a loving environment. All of them make a strong point about the strength of the individual in the face of external pressures. It’s one of the reasons why “Skip Beat!” is such a good coming-of-age story, as it shows these young people finding their own paths. Meanwhile, however, the role of parenthood is not downplayed or brushed away (no Disappearing Parent Syndrome here, ladies and gents). Whether to motivate or to nourish, parents are there, and they’re important. But this is a shojo manga, so we know which relationship is put at the forefront. Brace yourselves, ladies, for next time, we take a look at the love interests. Stay tuned for: Sho Fuwa and Ren Tsuruga - Similarly Dissimilar.